Are alien abduction movies about to become fashionable again? I guess that depends on whether a break-out hit takes the box office by storm, and perhaps this announcement from Metrodome Distribution is one of them, only time will tell. Written and directed by Jason R. Miller, Unidentified stars Parry Shen, Colton Dunn, Eddie Mui and Eric Artell. Out on DVD this coming 21st October, this one has a runtime of 88 minutes and a recommended retail price of £12.99. During a wild weekend in Las Vegas, four young friends get into trouble with a loan shark and must skip town in a hurry. But gambling problems may be the least of their worries after they get stranded in the Nevada desert. 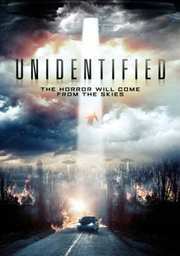 One of the guys discovers a mysterious metal fragment, then promptly goes missing during the night. When the remaining three catch up with their lost friend, there's something different about him. As his condition worsens, the others realize that something unearthly might be stalking them in the desert.